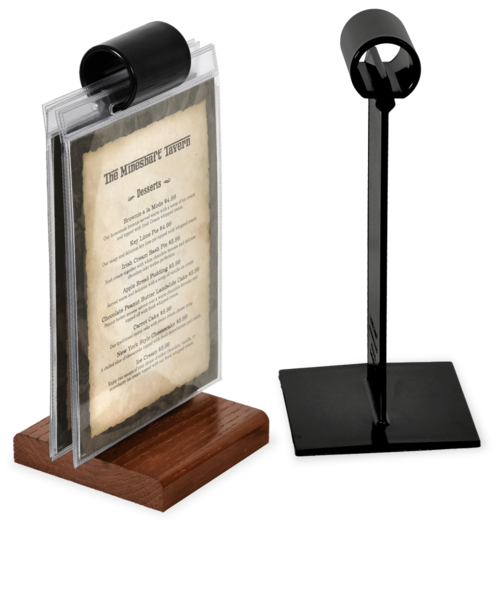 Use these plastic menu stands to display multiple products when our wooden flip stands just don't fit your decor. Doughnut roll top snaps on and off to hold up to twelve clear plastic pockets. Base measures 4 in. x 4 in., unit stands 8 in. (for smaller sleeves) to 9 in. tall. Stands are available in two sizes as shown. 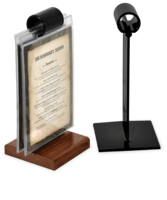 Each size is available in two versions: all black plastic or black plastic with an oak base. Either version is easy to clean and practically indestructable. 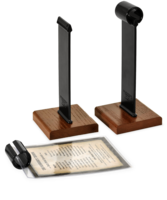 Use these plastic stands to display multiple products when our wooden flip stands just don't fit your decor. Shop online with the Menu Shoppe today.